A majority of veterans and active duty military members suffer from a variety of musculoskeletal injuries or conditions as a result of their services. Similarly, many of these individuals are affected by emotional disorders, such as post-traumatic stress. Many are in great need of medical services but currently, a diverse amount of organizations and institutions located around the nation have started providing medical benefits for these valuable individuals. Dr. Angel Hong refers to holistic care as treatment for the whole person by taking into account the mental and social factors rather then only the physical symptoms of an injury or condition. “I go with the three T’s: trauma, toxin and thoughts,” Dr. Hong stated. “All three of them have to be treated together.” Furthermore, she explained that on occasion, symptoms could be caused by an unexpected element, such as lack of sleep resulting from poor nutrition or too much emotion. According to Dr. Hong, research has indicated that Chinese medicine as well as alternative healthcare, can greatly ease symptoms of PTSD. Healing Heroes in the Heartland event coordinator, Karen Buchanan mentioned that in a prior year, the organization had administered about 585 treatments and 293 hours of acupuncture and reflexology. Approximately $33,000 in services were provided free of charge. Mr. Ernest Ledtje, spoke in regards to the various treatments he had received at HHH which helped improve his back pain and breathing complications. After being recommended to assist the facility by another veteran, Mr. Ledtje experienced many great benefits from the organization’s holistic treatment procedures. “I’m not eating pain meds like candy anymore, and I’ve cut my breathing meds in half,” he quoted. Healing Heroes in the Heartland is a small institution located in Rock Island, IL but similar programs and institutions can be found locally to assist veterans and active duty service members. As a result of Public Law 107-135, chiropractic treatment is guaranteed for all eligible Veterans Affairs patients and it’s been included in the Medical Benefits Package since 2004. Furthermore, the VA can also refer an individual to a private chiropractic clinic, if the services are not available on site, through its fee-basis, where a primary care provider can approve to cover an individual’s bill for the chiropractic services they received. The Patriot Project was also established to provide free chiropractic treatment for veterans with service associated disabilities, active duty service members, and Gold Star dependents. Currently, over 500 chiropractors across all 50 states are participating in the Patriot Project. 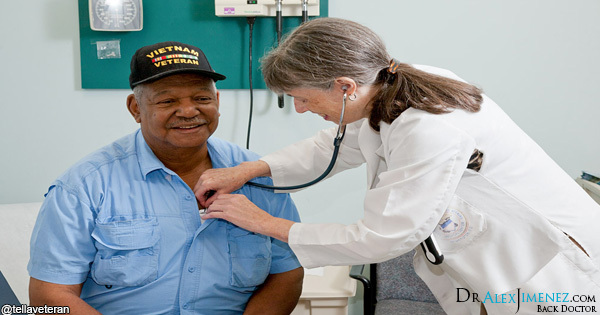 The El Paso Veterans Affairs Health Care System works diligently to serve veterans and other beneficiaries as well as aim towards the highest quality and continuous improvement.